what it was. 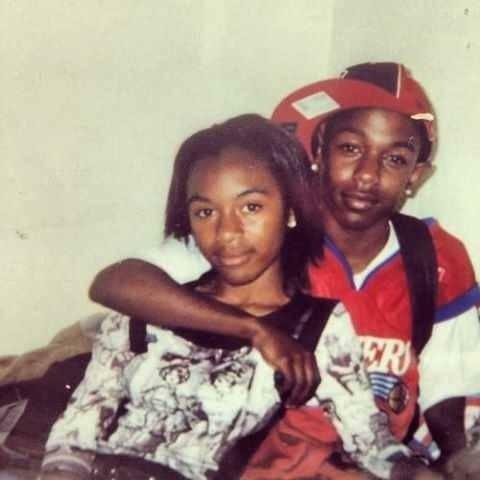 BTW, this wasn't Sherane in the video for "Backseat Freestyle," but here is a flick of little K. Dot and the real Sherane as kids. Awwww! Yes ASAHD's name is in caps and don't you forget it. This is a new love story for DJ Khaled, but his Snapchat and Instagram are flooded with short videos of his beautiful baby boy. ASAHD (caps, still) is even executive producing Khaled's next album. That's even better than Blue Ivy getting on the Billboard charts as a newborn with Jay Z's "Glory." Listen. LISTEN. Let's all be adults here. This love triangle led to the greatest story of reconciliation and acceptance in rap history. Yes, Biggie married Faith after knowing her for like a few hours (estimated) and, in the midst of all that, was also with Kim. But combined, it makes one hell of a love story that lives on in Big's honor. So, uh, speaking of Bad Boys, are we ready to accept that this is still happening or nah? Have to check the tabloids to see if this relationship is still going strong, but Gucci eating kale was love at first sight when it happened. Kale has made him a better man. He's a healthy La Flare now and looks amazing. See what a good dish of kale can do for a man? Remy Ma and Papoose are the realest REALEST definition of "ride or die." This marriage survived prison. Seriously. It's real and it's serious. Kanye's love of himself is something that can't even be summed up in an episode of Keeping Up With the Kardashians. This interview with Zane Lowe does a good job of showing how much Kanye loves himself though. Even when someone else is in the room, it's like it's just Kanye...and Kanye. We first met Julius Caesor back in 2013, and this has arguably been the longest relationship in French Montana's career. They take private jets together, Julius gets to be in movies. Hell, TMZ ANNOUNCED HIS ARRIVAL. Julius was V.I.P. from jump. Just because it's over doesn't mean it didn't mean something. Plus, Tip and Tiny have all those kids together. This was a love story that lasted uncomfortably long until their abrupt breakup. Pharrell is currently involved with a beanie. In 1994, when Common (then Common Sense) wrote an ode to his love of hip-hop, he personified the culture as a woman. While this song was a love affair seemingly gone sour, Common found love for H.E.R. again. Not to seem insensitive toward the aforementioned Common, but the love between Andre 3000 and Erykah Badu felt nothing short of magical. Imagine if these two were still together? IMAGINE! Sorry, just trolling to see if you're still "keeping up." This romance was supposed to last forever, especially since they survived that ridiculous beef between Meek and Drake. It didn't though. Oh well. True love doesn't exist. Carry on. We're still holding a candle for this relationship since they recently showed some PDA at a pre-Grammy party. Wiz and Amber seemed perfect for each other. Plus, when Muva twerks to your song and a modern art portrait of your FACE, you know it's real. Sigh. Actually, the love affair between Wyclef and Lauryn was pretty twisted and painful, but it still gave us The Miseducation of Lauryn Hill, so it has to be acknowledged as one of the greats. OK, SO WHAT if this wasn't a real romance. The video for "Dilemma" was reason enough to qualify this as the greatest love story that never was. Nelly and Kelly had such strong chemistry and this video was proof. Seriously, their connection was so strong that Kelly texted Nelly on a Microsoft Excel spreadsheet and he STILL got the message to come over!